Over the past few months, I've been lucky enough to find myself in NYC for both work and for fun. On one such trip, I received a tip from an Instagram follower (thank you @shrinkmuch!) to check out Dig Inn, which serves up seasonally-inspired bowls that are made with farm-fresh ingredients that are naturally gluten-free. With this description I'm sure Dig Inn sounds like every other fast-casual, healthy fare, build-a-bowl concept that is popping up in these days. I must admit that I too was skeptical initially because this mold of restaurant has reached a saturation point. However, always on the lookout for quick, affordable, and (most importantly) safe food in New York, I decided to check my preconceived notions at the door and see if Dig Inn could break the fast-casual mold or stand apart from the pack. Dig Inn definitely scores points for the lunch break crowd, because their ordering process allows for maximum customization of bowls but their assembly line style of bowl building is quick and efficient. Don't let long lunch lines fool you- you'll get your food soon enough. The menu, which changes seasonally, labels each component's allergens, which makes ordering easy. When I visited, Dig Inn was on their winter menu, which meant that the only gluten-containing items in store were the faro (base for bowls), mac and cheese side, and cookies. 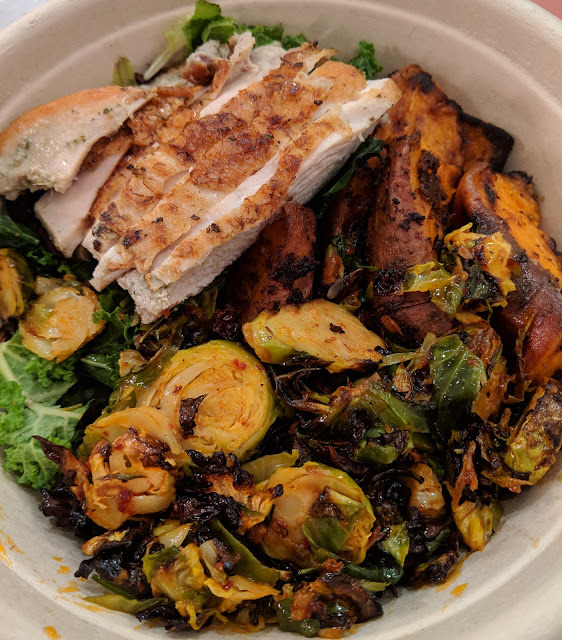 For my bowl, I ordered the farm greens with mint as my base, with sweet potatoes and brussels sprouts as my market sides, with chicken as my protein. My bowl really channeled a Thanksgiving or holiday feast vibe, and Dig Inn's superb execution of each component took me right to my homestyle cooking happy place. The greens base was fresh with fragrant mint providing a lovely contrast to the lettuces. Perfectly roasted with sea salt and rosemary, the sweet potatoes were hearty and filling. The chicken, also simply roasted with spices, had a wonderful tender texture that could shame any store-bought rotisserie chicken. The pièce de résistance through was the brussels sprouts, which were cooked with Thai basil, cilantro, ginger, lime, and honey-chili vinaigrette. Both sweet and spicy with earthy notes, the brussels were absolutely top notch. I absolutely savored every bite, and want to thank Dig Inn for helping me fall even deeper in love with my favorite winter veggie. I did not expect to be as blown away by Dig Inn as I was. Despite all the design-your-own bowl restaurants I have visited, Dig Inn managed to not only impress me, but also stick in my memory for days (and now weeks later) as I can't help but salivate when I think of my meal. I eagerly anticipate my next visit, and will definitely make this a priority stop any any New York City trip going forward (and it's easy enough to because Dig Inn's locations are sprinkled throughout the city).